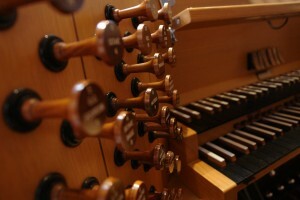 The Saint Mark’s organ originally was built in 1987 by Casavant Frères of Saint-Hyacinthe, Quebec, as their opus 3616 (see below for more information about Casavant). The organ was enlarged in 2016, also by Casavant. The original 1987 instrument was designed by Jean-Louis Coignet, then the firm’s Artistic and Tonal Director, in collaboration with Gary L. Garber, then the Organist-Choirmaster at Saint Mark’s. 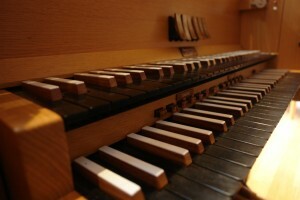 The original instrument comprised 21 stops, 27 ranks, and 1601 pipes on two manuals and pedal (see the original specifications of the 1987 organ). Original plans called for a fuller instrument, and in 2015 Saint Mark’s contracted with Casavant to enlarge and complete the parish organ. The completion plan, adapted by current Casavant Tonal Director Jacquelin Rochette in collaboration with current Saint Mark’s organist Tyler W. Robertson, included the creation of a new expressive division and a new, movable console with three manual keyboards. Completed in July 2016, the instrument now comprises 35 stops, 41 ranks, and 2450 pipes (see the current specifications of the completed organ). The Organ Completion Fund was established in 2013 to receive gifts for the purpose of completing the parish organ. Contributions are warmly appreciated and may be made online HERE. The French-Canadian organ building firm Casavant Frères was founded in 1879 by the brothers Claver and Samuel Casavant. Before establishing their own workshop, the brothers traveled extensively throughout Europe, working with notable organ builders such as John Abbey and Aristide Cavaillé-Coll. The instrument that first established their international reputation was the four-manual mechanical-action organ for the Church of Notre-Dame in Montreal, completed in 1891. Throughout their careers the brothers sought to incorporate technological advancements in their designs, culminating late in Claver’s life when the company was awarded the Grand Prix at the International Exhibition in Antwerp, Belgium, in 1930. Over time the sound and style of Casavant organs has evolved significantly under the influence of successive tonal directors of varying backgrounds. Claver Casavant’s successor, the Englishman Stephen Stoot, incorporated English influences. The American Lawrence Phelps and the German Gerhard Brunzema, meanwhile, brought an interest in the German reform movement. The Frenchman Jean-Louis Coignet, the Tonal Director when the Saint Mark’s organ was built, is one of the foremost experts on the great French organ builder Cavaillé-Coll and served from 1981 to 2005 as the Expert-Organier for the city of Paris. The present Tonal Director, the Canadian Jacquelin Rochette, has been with the firm since 1984, succeeding Coignet in the top post in 2004. He is a renowned organist whose recordings of works by Louis Vierne and Marcel Dupré have met with critical acclaim. For more on Casavant, visit the Casavant home page. For information about special music events at Saint Mark’s, please see the full 2016–2017 schedule for the Saint Mark’s Music Series. If you are interested in receiving periodic communications regarding the musical offerings at Saint Mark’s, we invite you to become one of our Friends of Music at Saint Mark’s.